1 Then one of the seven angels who had the seven bowls came and said to me, “Come, I will show you the judgment of the great whore who is seated on many waters, 2 with whom the kings of the earth have committed fornication, and with the wine of whose fornication the inhabitants of the earth have become drunk.” 3 So he carried me away in the spirit into a wilderness, and I saw a woman sitting on a scarlet beast that was full of blasphemous names, and it had seven heads and ten horns. 4 The woman was clothed in purple and scarlet, and adorned with gold and jewels and pearls, holding in her hand a golden cup full of abominations and the impurities of her fornication; 5 and on her forehead was written a name, a mystery: “Babylon the great, mother of whores and of earth’s abominations.” 6 And I saw that the woman was drunk with the blood of the saints and the blood of the witnesses to Jesus. The language here is potent, and the subject matter below may be difficult for some readers, particularly those who would be triggered by imagery of sexual violence and the metaphorical use the word whore. Rhetorically this is a powerful use of satire to subvert many of the images of strength and piety that were a part of the portrayed identity of Rome. Interpreters across the generations have used this passage as a basis for satire in their own time. 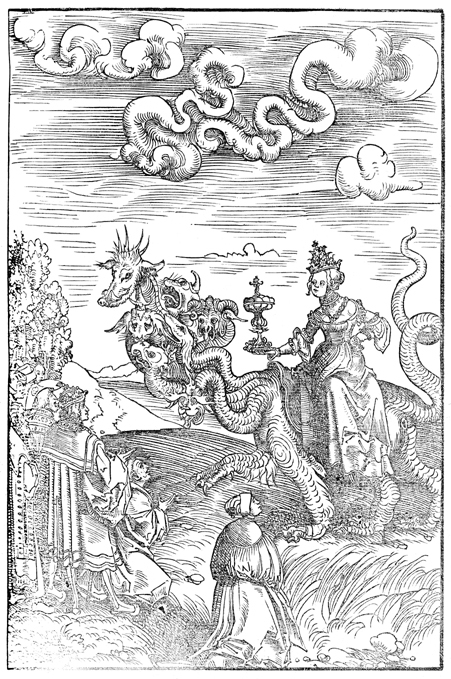 For example, Lucas Cranach the Elder in his initial edition of illustrations for Revelation portrayed the woman on the beast wearing a papal tiara, which visually reinforced that for many followers of Luther in their time they viewed the pope and the Roman catholic church as a reading of the text for their time. In later editions Cranach would modify the woodcut to have a simpler crown and a less political reading. Even though the initial readers of Revelation would have seen the imagery pointing satirically to the Roman empire of their day instead of the Roman catholic church, the understanding of the satirical intent of the text has been consistent. 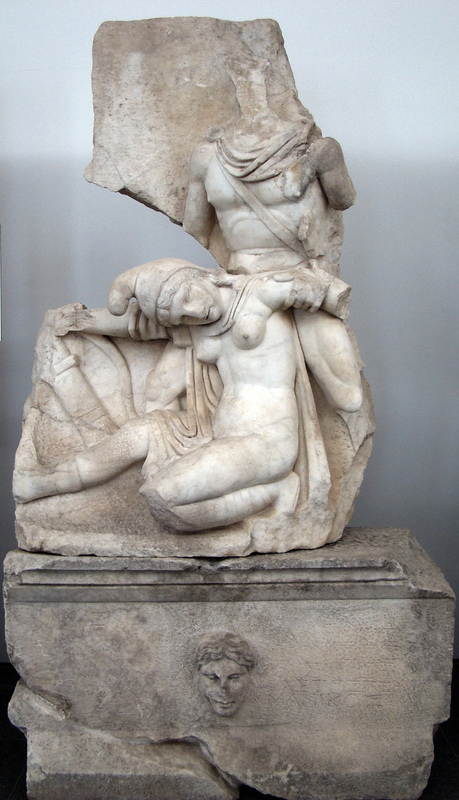 For all the Roman empire’s talk of piety, they had no trouble using images of women being abused or raped by the emperor in military garb as a metaphor for the military conquest of nations. 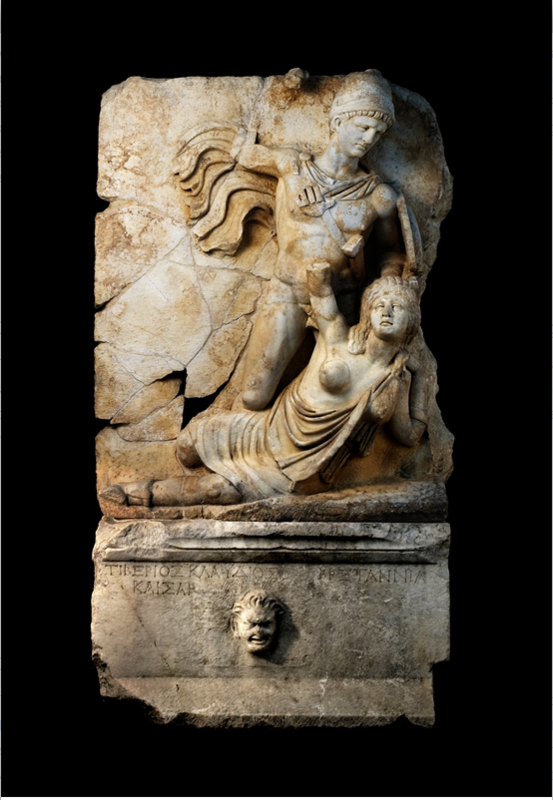 For example, in the excavations at Aphrodisias we can see in two reliefs emperor Claudius conquering Britain and Nero conquering Armenia portrayed as a soldier who is overpowering a woman. Much as the imagery of Rome the conqueror shows that conquering soldiers in this time did not pay for a prostitute but instead took women against their will, now Rome itself is torn apart by the very powers that once paid it homage and honor. Revelation understands that the forces aligned against God are indeed a house divided and they will devour one another even before Christ arrives. The violence that created the empire will become its undoing in John’s vision. This entry was posted in Biblical Reflections, Revelation and tagged book of Revelation, Metaphor, portrayal of conquered as women, Revelation, Revelation 17, Satire. Bookmark the permalink.